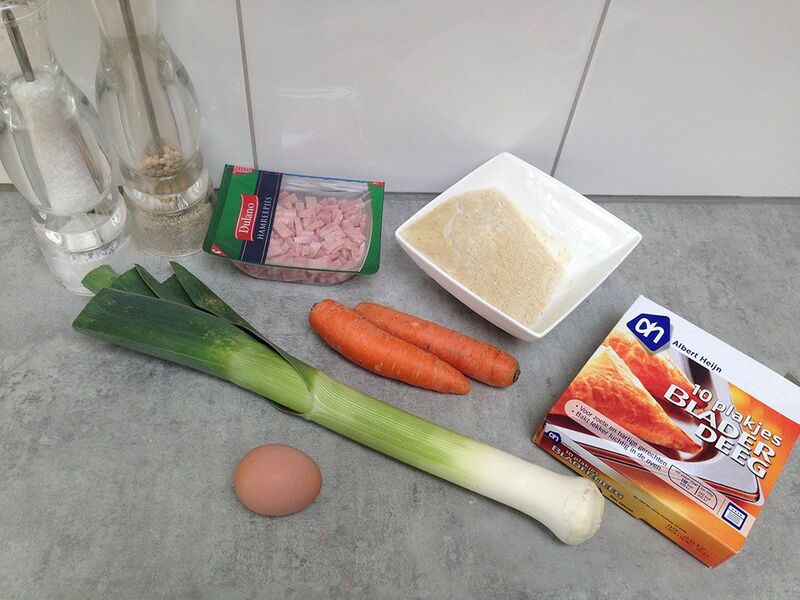 If you choose to make your own bechamel sauce, you can follow the recipe here. If you bought a jar of bechamel sauce in the store, you can immediately start to prep the vegetables. PEEL the carrots and chop them into small cubes. The easiest way to do this is cutting the carrots into strips and from there on into cubes. 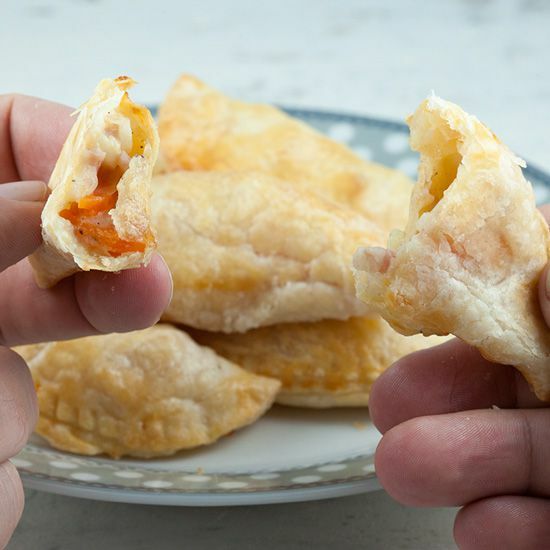 Keep in mind the filling should fit inside the tiny puff pastry sheets, so chop everything small enough. RINSE the leek and make sure you got rid of all the sand and dirt. CHOP the leek into small pieces and also chop the ham in smaller pieces if necessary. HEAT olive oil in the medium-sized skillet and saute the chopped carrots for 2 minutes. ADD the leek and ham and saute a few minutes more. Turn off the heat, add the bechamel sauce and season with pepper and salt. Let the filling cool off. REMOVE the plastic wrap from the puff pastry sheets and dust the work surface and rolling-pin with flour. ROLL out the puff pastry sheets until doubled in size. Now you can use the round cookie cutter to create thin round sheets. 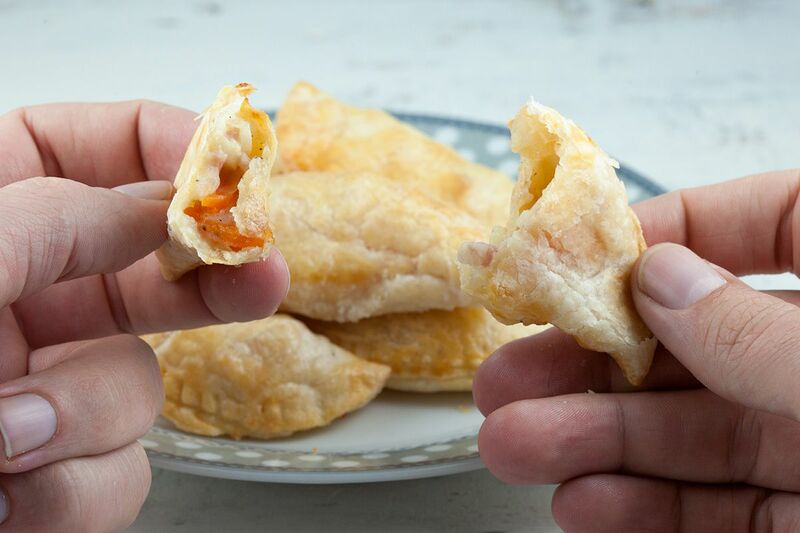 We’re going to make 12 puff pastries, so you’ll need 12 rounds. PLACE a bit of filling on one part of the round puff pastry and use your finger to divide some cold water on the edge, and fold the package shut. Use a fork to make sure they’re really closed, otherwise the filling will run out during baking. 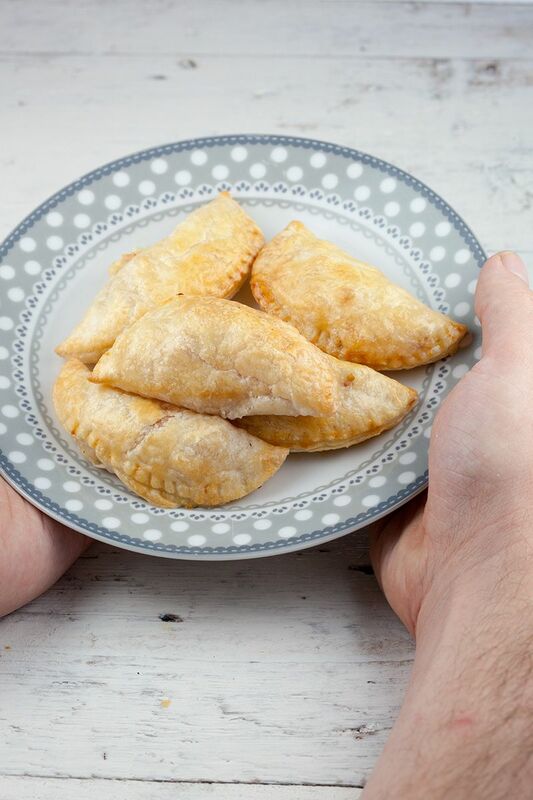 Repeat for all the puff pasty rounds and place them on the baking tray lined with parchment paper. BEAT 1 egg and coat all the puff pastry packages using the silicone kitchen brush. BAKE them in the oven for 15 minutes, or until golden brown. Enjoy! Thanks! They’re so amazing with any kind of filling, chorizo is awesome and goes great with a lot of things. I made chorizo empanadas a few years back and still planning on making them again for the site. But first I have to remember how I exactly made them, I sort of remember an awesome red onion sauce/salsa. But all the food every day, hard to keep everything in memory haha.